In looking back, I feel like we should have known. How did we not know? Weren’t the signs pretty obivious? Terrible gas, eczema, colicky crying, constipation, the alarming amount of spit up (about 3-4 costume changes a day for both of us) and so much night waking. SO. Much. We were devoted attachment parenting followers. What were we doing wrong? I was completely self-sacrificing. I became hooked on several canceled televisions series on Nextflix as I held my swaddled babe and bounced him on a yoga ball for every nap. I had read the ‘right’ books that would lead us to a parent-child relationship paradise filled with good times and every need met before a need was even known (Yes, you guessed it, this was our first child). Why, then, did it seem my baby was not the ‘happiest baby on our block’? This entry was posted in Guest Posts, Uncategorized on October 11, 2014 by Kandi. Summer berries are here in full swing! It may be too early in the season to feast on homegrown fruit, but local farmers markets and supermarkets are fully stocked with an assortment of colorful berries, lush and bursting with flavor. Sweet, versatile and nutritious, strawberries are one of the most well-liked fruits in the United States and perhaps the most popular of all the berries. In addition to their distinct, juicy flavor and gorgeous crimson color, strawberries are packed with fiber and potassium and have the most Vitamin C of any berry, all at only 25 calories per half cup. Nowadays the fruit is usually available year round, but peak season is from April to July when strawberries are welcomingly inexpensive. Take your summer strawberries to a new height with this dairy-free, gluten-free and egg-free dessert. I love making panna cotta (Italian for “cooked cream”) during the warmer months — the traditional creamy eggless custard is thickened with gelatin and chilled until set (no oven required!). This not-too-sweet dark chocolate panna cotta is a recipe you’ll find yourself turning to again and again not only because of its simple preparation but also because it is elegant, impressive and deliciously satisfying (and who can resist deep, creamy dark chocolate lusciousness on a spoon?). Another bonus is the make-ahead nature of panna cotta; since it needs to set, you won’t be juggling dessert at the same time as your other dishes. As chocolate is so versatile, the dark chocolate panna cotta can be dressed up differently each time you make it: think chocolate shavings, toasted or caramelized nuts, fruit coulis, crushed toffee, chocolate or caramel sauce, or simply a raspberry and mint leaf. But why stop there when strawberries are here and at their peak of flavor? Enhance them and the dark chocolate with a splash of aged balsamic vinegar for a truly unforgettable summer dessert. Enjoy this simple summer dessert perfection and let me know how yours turns out. Make the panna cotta: Spray four ceramic ramekins lightly with flavorless cooking oil spray. Set aside. Place the soy milk in a small saucepan and sprinkle the gelatin over it. Allow the mixture to stand at room temperature until the gelatin has softened and absorbed the liquid, about 10 minutes. In the meantime, combine the coconut milk, sugar and salt in a medium saucepan and bring just to a boil. Remove the pan from the heat, add the chopped chocolate and let it sit for a minute until the chocolate has softened. Whisk the chocolate mixture until smooth. Gently heat the gelatin mixture over low heat, stirring frequently, until the gelatin has just dissolved and the mixture is liquid. Pour the gelatin mixture into the chocolate mixture and whisk until well blended. Pour the finished mixture into a 4-cup measuring cup with a pour spout and divide evenly among the prepared ramekins. Allow the mixture to cool to room temperature, then cover loosely with plastic wrap and refrigerate at least 3 hours or overnight. To serve, dip each ramekin into boiling water for a few seconds, then quickly invert onto a serving plate. Top generously with the strawberries and balsamic sauce and serve immediately. Rachelle Ferneau is pastry chef, chocolatier and owner of Dear Coco Chocolate, which specializes in artisan dark chocolate truffles in globally-inspired flavors designed to transport you around the world through chocolate. All Dear Coco Chocolate truffles are dairy-free, gluten-free, vegan-friendly, certified kosher pareve and 100% handcrafted using premium ingredients, in small batches, and without corn syrup, trans fats or preservatives. Please visit www.DearCoco.com for more information. This entry was posted in Guest Posts, Recipes on June 25, 2013 by Kandi. Disney Dreamers Academy with Steve Harvey and Essence’ Magazine motivates teens to achieve their own particular goals and encourage them on a path to success. Students are involved with many workshops that present the tools they will need to turn dreams into reality. In a robust four-day series of events, the Dreamers engage in a wide range of experiences while working hand in hand with community and industry leaders, Disney Cast Members and some of today’s top celebrities. Dreamers not only learn how to motivate themselves, but also how to inspire their friends, families and communities. More than 5,000 teens across the country applied for the 2013 Disney Dreamers Academy. Only 100 were chosen to attend. They are chosen based on their qualities as a leader, or because they inspire others by giving back and volunteering in their own communities. Many show great courage by overcoming incredible odds in their home lives, yet they keep their eyes on their dreams. Dreamers were welcomed by Steve Harvey, Mikki Taylor (Essence Magazine), Tracy D. Powell (Disney’s Executive Champion for DDA), Meg Crofton (President Walt Disney Parks and Resorts) and Yolanda Adams (Gospel Star). Students participated in many workshops and activities to help them visualize their dreams. Celebrities joined in for many activities including a Q & A session with the students and media. Conversations with Terrance Jenkins (Actor and News Host), Lance Gross(Actor), James Pickens, Jr.( Actor, Grey’s Anatomy), Lamman Rucker (Actor), Kellie Wells(Olympic Track and Field Star), and Chandra Wilson (Actress, Grey’s Anatomy). After the workshops are finished, the ceremonies complete… it is time for the 2013 dreamers to take the tools they gained at the Academy out into their world and start using them to follow their dreams. Congratulations to the unique and talented students and their future endeavors. I expect great things from them. This entry was posted in Disney, Guest Posts on March 21, 2013 by Kandi. Lets start off with a bit of truth, I am Jessi, normally I write for Ramblings of a Caffeinated Army Wife and unlike the owner/writer of this blog I am not Gluten Free. My home is not Gluten Free. In fact, in our home, we embrace the gluten in wheat flour almost as much as we embrace coffee. That being said, if you follow Gluten Free for Jen on Facebook, you have probably seen me comment or post from time to time as #2 the second admin around the page. I love to bake and create recipes although I am not a great baker but I am a pretty good one. A great baker can make amazing flavors and can make everything look pretty too. I on the other hand, can make above average tasting foods, but they rarely look pretty or elegant…ok so they never look pretty or elegant. But, like I said, the flavors and textures are good, just ask every neighbor who has ever lived near us! Along with a love of baking, I love a challenge. I have been watching Kandi – owner of this blog, struggle with the different textures of gluten free breads, and recipes the past couple years. For some reason I thought I could help, even though I know NOTHING about baking with gluten free flours. I did not know what I was getting into! I did not pass this information on to anyone at the time, I was just thinking and researching, mostly just thinking. I know the textures of my cinnamon rolls, I can make them without touching my recipe, and I understand the chemistry behind baking from scratch. Plus my basic dough can be used for so many things from cinnamon rolls, dinner rolls, stuffed bread recipes etc and so I decided to tackle this project using my own cinnamon roll recipe but convert it to a gluten free. Converting it required a few phone calls, a bit of research online about gluten free flours and a trip to my local specality food store. At the store I ran into the baker who creates gluten free items daily and she offered me a few tips that ended up being EXTREMELY helpful in this process! Admititly, I am not an expert by any means, and I probably went overboard with my additions because I did not know what I was doing. 🙂 The first batch of dough went into the trash. I knew as soon as I mixed it up that it was not going to rise, and 10 minutes later, I confirmed my suspicions. Gluten free flour is different from wheat flour, obviously its made without gluten but gluten is what gives doughs their stretchy quality, its what allows the dough to rise and stretch. Without the stretch, dough can not rise. In theory it would be like asking corn starch to rise, hey it looks like flour right? Not so much! I also learned in research that not all gluten free “all purpose” flours are the same! Who knew! Well apparently a lot of people knew but I didn’t. You will find a gluten free all purpose flour in my recipe, along with xanthan gum and guar gum. Why?, because I was determined to give this a real stretchy sticky texture! Like I mentioned earlier, I may have gone a bit overboard but the end result was a beautiful stretchy dough, and if I had not made it myself I would not have guessed the ingredients. Which I am guessing is a big success! Use the basic dough recipe for just about anything! Cheesy bread, bread sticks, cinnamon rolls, cinnamon raisin swirl bread, stuff bread loaves and light n fluffy dinner rolls! I do! Start by getting the water boiling. Into a large mixing bowl cream together butter and sugar then add evaporated milk, boiling water, eggs, salt, oil. This is a whole lotta liquid! But liquid is good! In a separate bowl, warm milk and honey together but do not boil or scorch the milk. Once the honey and warm milk have made friends 🙂 add the yeast and stir just a bit then set aside while you deal with the dry ingredients. I sifted the gluten free all purpose flour before measuring it into a completely separate bowl. Yes at this point I was using 3 different bowls, but better still soon you will have a 4th bowl in play. Did I mention I am not the most organized baker? I sifted out 6 cups of gluten free all purpose flour, into a 3rd mixing bowl because I was not sure how much it would take. I would recommend this! In the 4th mixing bowl I put 2 cups of flour, because I knew I would need way more than 2 cups so it was safe to use and sifted the guar gum/xantham gum/baking powder together. Check on your yeast! Is it creating bubbles? Is it rising? Does it smell of wonderful delicious bready bread breadness? If yes, then yay! Add it to your liquids, making sure to get all the yeast into your mixing bowl! Now that we have all the liquids into one bowl, we can begin adding the dry ingredients. Gluten Free Dough CAN Stretch! First begin adding the mix of flour/gums/baking powder slowly to your liquids. This will be a sloppy mess at first, so go slowly and be patient. Once that mix is fully incorporated begin adding more sifted all purpose flour about a cup at a time. I did take a break while I was adding flour, to take a phone call and while I was on the phone the flour absorbed a lot of liquid. So I would recommend taking a 5 minute break! I ended up using 4 1/2 cups of gluten free flour, but it may take slightly more or less depending on the ratios used in your all purpose mix. Now once your dough looks similar to mine, put a tea towel over it and walk away. Give the yeast and all the ingredients time to get to know one another. Bread is not an instant thing, it takes time. This rise should take about 20-ish minutes depending on how warm your kitchen is. You want your dough to almost double! Then flour your counter, and turn the dough out. Its time to kneed some dough! Sprinkle a bit of flour onto your dough ball and kneed it for a few minutes, incorporating more flour until you have a nice smooth soft dough. Cover this again, and let it rise one more time. It will double again. Once the dough has doubled for a second time. You are done. Basic dough, full of great flavor and gluten free goodness! Ready to use for any idea you can dream up. I made these into cinnamon rolls and sticky buns! Melt all this together on the stove and then cover the bottom of a well greased cake pan, then add your sliced cinnamon rolls around the pan. Bake at 350 for around 15-20 minutes until they begin to turn golden brown. Remove from the oven and turn out onto a cookie sheet as soon as they come out! This entry was posted in Guest Posts, Recipes on January 20, 2013 by Kandi. Autumn flavors are sentimental, powerful, and infinitely memorable. Pumpkins, hearty soups and stews, and desserts with deep, warm fall spices leave delicious lasting impressions. Some time ago I discovered an easy shortcut to infusing warm, spicy flavor into autumn desserts: concentrated chai tea. Left undiluted, this product packs a sweet, spicy punch and instantly adds depth of flavor to desserts such as cakes, muffins, quick breads and custards – just substitute it for some or all of the other liquids in the recipe. In honor of the official start of pudding season in October, I recently made rich Baked Chocolate Chai Custards with Spiced Cream (gluten free). The perfect dessert for this time of year, these custards contain the richness of chocolate, the warmth of exotic spices, the comfort of a soft pudding and best of all, the ease of preparation. Preheat oven to 325. Have ready six individual ceramic ramekins and a 9 x 13 baking dish with tall sides. In a small saucepan, heat chai tea until just boiling. Remove from heat, add the chocolate and let sit for one minute until the chocolate has softened. Whisk until all chocolate has melted and is fully incorporated. Add cream to tea-chocolate mixture and whisk until combined. In a medium mixing bowl, whisk eggs until smooth. Add sugar, salt and spices and continue whisking for one minute until mixture is uniform. While continuing to whisk the eggs slowly, pour tea mixture over the eggs and combine well. Divide custard evenly between the six ramekins. Place ramekins carefully in the baking dish and add about 3 cups of boiling water to the dish so the water reaches about halfway up the ramekins. Make sure not to splash water into the ramekins. Carefully transfer the baking dish to the oven and bake for 40 to 45 minutes, or until the custards are set but still slightly jiggly in the centers. Remove dish from oven and set aside to cool, leaving the ramekins inside. While the custards are cooling, make the spiced cream: combine all ingredients in a small bowl and stir until the sugar has dissolved. When custards are cool to the touch, remove them from the water bath, top with a spoonful of spiced cream and sprinkle with natural cocoa powder. Best when eaten warm. Rachelle Ferneau is pastry chef, chocolatier and owner of Dear Coco Chocolate which specializes in globally-inspired, premium artisan chocolate truffles designed to transport you around the world through chocolate. All Dear Coco flavors are dairy-free, gluten-free, vegan-friendly, certified kosher pareve and 100% handcrafted in small batches without corn syrup, trans fats or preservatives. Please visit www.DearCoco.com for more information. This entry was posted in Guest Posts, Recipes on October 19, 2012 by Kandi. Start young: The sooner you start teaching your child about a living a healthy lifestyle, the easier it will be for them to make better decisions as they get older. You can start showing them a healthy lifestyle as early as when they start walking and talking. Children adopt behaviors and habits pretty quickly, especially exercise and foods. Educate and Lead: Teaching your child is key. Sitting down with them and letting them know things like why veggies and exercise are beneficial to their health will help them understand. If they understand why being healthy is good, the more likely they are going to accept it and want to do so. Allowing them to help you prepare meals is a good teaching tool. Now once you teach them this means it is also very important that you lead by example. Believe it or not, your children look up to you for everything. If you lead this lifestyle, they will follow. Make it fun: If you make being healthy a chore, your kids will resist. Make being active fun by signing them for team sports. Not only is it great to get them active, it’s good for socializing and learning at an early age how to work in a team setting. Most kids find veggies intimidating and ‘gross’. You can make eating veggies fun by letting them play with their food. Example, ants on a log: celery with peanut butter and raisins as the ‘ants’. Or simply calling broccoli dinosaur trees can make eating veggies enjoyable. Starting early, teaching and leading and making a healthy lifestyle fun are great ways to a healthy lifestyle. Eat more veggies and skip the junk food. Sign them up for neighborhood team sports and watch them grow physically and mentally. A healthy kid is a happy kid. They will thank you when they are older. Here’s to a healthy lifestyle! Melanie Slaugh writes extensively for internet service providers and also topics related to that. She provides the information to consumer on the need to choose the right Internet package for them. She can be reached at slaugh.slaugh907 @ gmail.com. This entry was posted in Guest Posts on June 8, 2012 by Kandi. This entry was posted in cookies, Guest Posts, Recipes on April 24, 2012 by Kandi. Today I’m going to share with you a pancake recipe that I have adapted and changed and tweaked off and on for the past couple years…and I finally hit on what I was after. 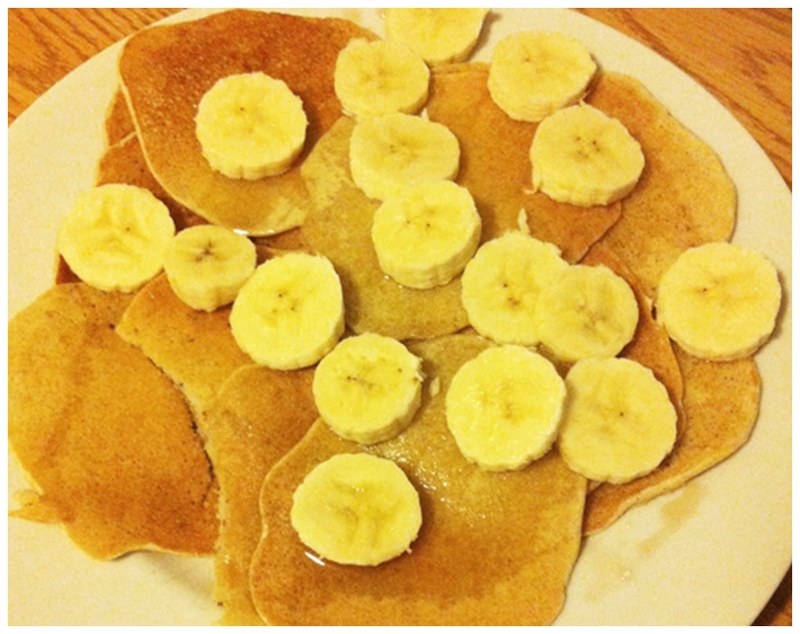 I wanted a typical pancake flavour, with a light, chewy texture often missing from gluten-free pancakes. This entry was posted in Allergy Free Wednesday, Breakfast, Guest Posts, Recipes, Slightly Indulgent Tuesday on April 17, 2012 by Kandi.